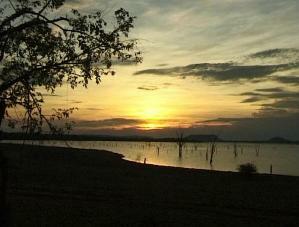 The Matusadona National Park is situated on the shores of Lake Kariba between the Ume and Sanyati Rivers. It covers an area of 1407 sq. km of which only a third is provided with roads for visitors. The other two thirds consists of very wild, rugged and inaccessible country. 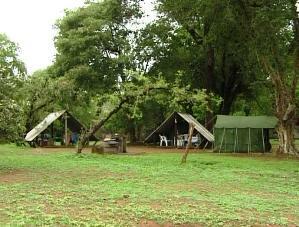 The park has a beautiful, shady camping ground at Tashinga on the lakeshore. There is an ablution block with hot and cold water, showers, toilets, wash basins and baths. 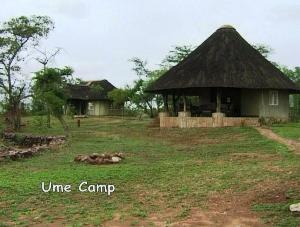 Firewood and braai facilities are available. Some of the campsites boast sleeping and dining shelters. For the adventurous canoes are available for hire to explore the shores of the park. The colours of an African sunset over water will provide spectacular memories of Lake Kariba and the unspoiled beauty of Matusadona. Visitors are allowed to get out of their cars and view game on foot, but this is done at their own risk. Wild animals are dangerous and unpredictable. Elephant, buffalo, impala, kudu and waterbuck are plentiful, whilst rhino, lion, sable, eland and zebra are frequently seen. Escorted walks with a game Scout are possible, subject to availability of staff at the time. Free fishing throughout the year is obtainable in the Kariba Lake. Tiger, bream and vundu provide good sport but a word of warning - look out for crocodiles when standing at the water's edge and avoid swimming in shallow/shoreline areas.